SpeedNews Conferences deliver an array of information to the aviation industry that is unmatched in its quality and depth to stakeholders in commercial, defense, business and general aviation, aerospace manufacturing, raw materials, and M&A. 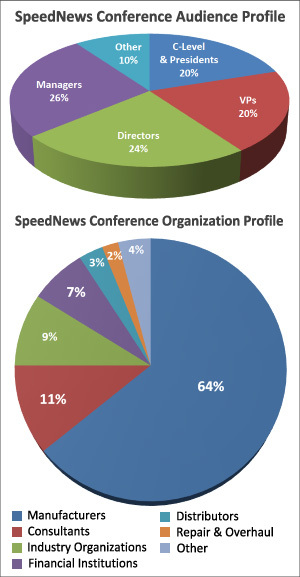 SpeedNews Conferences is the world's most prominent developer of aerospace and aviation information sharing events, providing global aerospace and aviation leaders, executives, and decision makers with targeted industry information, data, updates, forecasts, and professional networking opportunities. To stay on top of our Conferences, please view the current issue of Conference Watch - the newsletter which provides a glimpse into SpeedNews Conferences, the highlights and the foresights, and a peek into our Conferences on the horizon. Please contact Joanna Speed by phone at +1-424-465-6501, or email with questions about our speaking opportunities or general information about our Conferences. Meet the SpeedNews Team and Learn How We can Help You Grow Your Business! SpeedNews has the capabilities, expertise and experience to help organizations within the global aviation market capture business, make informed decisions and grow. Stop by our registration desk at one of our Conferences, or email admin@speednews.com to learn how our newly expanded capabilities - data & analytics and marketing services - can help you generate the relationships and business you are looking for. We look forward to seeing you at one of our Conferences! SpeedNews Conferences is pleased to offer the Year-Round Access Pass option to our loyal Conference delegates. Please contact us if you are interested in becoming an official conference sponsor or advertiser.